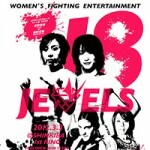 Japan’s all-female Jewels promotion staged its first event of 2012 tonight at Shin-Kiba 1st Ring in Tokyo, Japan. Jewels: “18th Ring” was headlined by a bout between Mika “Future Princess” Nagano and Emi “Kamikaze Angel” Fujino. Both fighters were looking to climb back into title contention. In other action, former Strikeforce title challengers collided when Roxanne “The Happy Warrior” Modafferi took on ex-training partner Takayo Hashi. Mizuki Inoue, one of Japan’s top prospects, squared off with Australia’s Alexandra Chambers. MMARising.com has live play-by-play for the card. Referee for this bout is Ryogaku Wada. Fujino rushes forward and barely gets out two punches before putting Nagano against the ropes. She lands a few knees before Nagano fights free and circles away. Fujino just runs her back into the corner again. Referee Wada breaks them up after both women land knees to each other’s legs. Fujino again runs Nagano into the corner to mash away with knees. Fujino wraps an arm around for a guillotine attempt and falls to her back. Nagano escapes by passing to side control, but her head remains caught. Nagano almost passes to mount, but Fujino is fighting to keep her at least in half-guard. Nagano keeps at it, though, and eventually gets to it. Fujino bucks, forcing Nagano to revert back to side control. Nagano goes for an arm, but Fujino escapes and drives Nagano into the ropes. Wada breaks them again. Fujino lands a hard one-two in close and sprawls on the following Nagano takedown attempt. Nagano has a leg, however, and manages to pull it out and put Fujino on her posterior just as the bell rings. Fujino steams forward and lands a steady stream of about four or five punches to Nagano’s face. She again pushes the Jewels poster girl into a corner where she mashes her up with more punches. Nagano circles away and shoots for a double in the centre of the ring. She gets the takedown easily and Fujino throws on a loose guillotine attempt. Nagano isn’t so much in trouble as she’s just caught in Fujino’s guillotine grip now. Nagano, realising she can’t break the grip, punches at Fujino’s ribs until referee Wada stands them back up. Fujino pumps a jab at Nagano until she can get close enough to smash her into the ropes again. Fujino lands a few token knees to Nagano’s legs before another break is called. Fujino pushes in again with punches before getting Nagano against the ropes. Fujino backs away to land more punches, but instead pancakes a Nagano takedown attempt. She pancakes another, but a dogged Nagano continues to push forward until Wada breaks them up. Fujino puts a blunt right hand on Nagano’s face in the standup, prompting her to shoot in again. Fujino sprawls and is driven almost out of the ring. She switches to a guillotine on her knees in the final five seconds, but there’s too little time to work any submission magic before the bell. Judges Tomoki Matsumiya, Kenichi Serizawa and Akira Yamazaki all see the bout for Fujino, who takes the main event victory. Winner: Emi Fujino by Unanimous Decision after two rounds. She improves to 11-5-0. Referee for this bout is Ryogaku Wada. There’s no glove touch coming into this fight. Both fighters come throwing leather at each other from the opening bell, but there’s little contact as either woman is just out of range. Modafferi throws in fancy kicks with thrusting side kicks and spinning back kicks, but they barely graze. After a missed Superman Punch, Hashi pushes an off-balance Modafferi with a right hand and takes top position in half-guard. Hashi fights to get to side control and tries to wrench out a Kimura from above. She passes, but Modafferi defends the submission attempt. Hashi drops short knees to Modafferi’s body and sets up for an armbar. Modafferi escapes but gives up her back in the process. Hashi forces Modafferi to her back again and Modafferi goes for a messy rubber guard, wrenching on her toes. Referee Wada stands them up. Modafferi pushes forward with punches, eating grazing counter shots from Hashi as she bullies her into a corner. Modafferi gives up her back in the rear waist-lock before lunging for a kneebar. Hashi doesn’t fall for it and takes the American’s back just before the bell. Modafferi misses a spinning backfist, but she racks up the punches with her follow-up flurry. Hashi tags Modafferi with stiff counters, but Modafferi is unfazed and again bullies Hashi into the corner. Hashi once again captures the American’s back in the waist-lock before tripping her to the canvas. Modafferi pops back to her feet quickly, though. It doesn’t stay there long as Hashi once again trips Modafferi to the canvas. From the top in half-guard, Hashi works for a straight armbar. Referee Wada looks like he wants to call a catch, but Modafferi flexes her arm and wards him off. Hashi transitions now to Modafferi’s back, but the tenacious American fights back to bottom in half-guard. Hashi passes to the side and again recaptures back mount. To her credit, Modafferi is staying active, punching over her shoulder. Hashi takes the mount and drops punches while postured up. Modafferi turns and gives up her back again. Thirty seconds remain as Hashi sinks an arm for a rear-naked choke. It’s there, but Hashi’s forearm is across Modafferi’s neck, meaning the choke isn’t exactly on perfectly. A straining Modafferi rides out the last 15 seconds of the bout as Hashi attempts to squeeze the life out of her. Judges Kenichi Serizawa, Akira Yamazaki and Tomoki Matsumiya all see the bout for Hashi, who earns the decision win. Winner: Takayo Hashi by Unanimous Decision after two rounds. She improves to 14-4-0. Referee for this bout is Kenichi Serizawa. Chambers circles away from Mizuki’s power hand as the Japanese fighter closes in, looking to trap her in the corner. Inoue jabs to test the space between the two, and Chambers answers back with a flurry of punches that Mizuki blocks and ducks under. Chambers lands a few token punches and chopping overhands, which only seem to annoy the Japanese fighter more than hurt her. Still, Chambers is connecting more than Inoue by this point. Inoue trips Chambers to the canvas from the clinch and slides right into mount. Inoue drops punches to the side of Chambers’s body, softening her up for an eventual submission setup. Then, referee Serizawa inexplicably calls for a standup. From mount. Inoue chases Chambers down and eats a few shots before pulling her into a single collar tie to slam hooks into the side of her head. Inoue then trips Chambers back to the canvas and works to keep her planted beneath her. Inoue goes for an armbar, and momentarily it seems as if Chambers is able to escape. However, Inoue hasn’t let go of the arm and is, in reality, readjusting. She flexes back and this time gets the submission at 4:32 of the first. Winner: Mizuki Inoue by Submission (Armbar) at 4:32 of round one. She improves to 3-1-0. Ozawa has a strong low kick, but it’s little match for Takada’s stiff lead hook and right cross. The looser and more relaxed of the two, Takada racks up punches to Ozawa’s face, flustering her slightly shorter opponent into throwing wild punches and hard leg kicks before circling out and away. Ozawa loosens up a little this round and starts engaging Takada. Unfortunately for her, Takada lets loose with more stiff punches of her own. While Ozawa is finally scoring with something beyond her leg kicks in this round, it’s Takada that is in the lead with her hard, head-snapping punches. Technique has largely been thrown out the window by the final round. Both women are swinging for the fences and swinging with evil intent. Surprisingly, Ozawa is holding her own against Takada and landing more than her fair share of brutal right hooks and straights. The bout ends with both women just slugging it out in the centre. A definite crowd-pleaser, this fight was. Winner: Yui Takada by Majority Decision (30-28, 30-29, 29-29) after three rounds. Referee for this bout is Tomoki Matsumiya. Tomimatsu spins Oya around off of a missed punch and steals her back in the waist-lock. Tomimatsu punches around “Amiba’s” defences, hitting her in the face. Tomimatsu then trips Oya to the floor and works to pass. Oya sets up an armbar in defence, but Tomimatsu slips out. Tomimatsu passes all the way to mount, but Oya slickly escapes and resets in half-guard. Tomimatsu passes again, this time to side control. Oya gets to her knees and drives forward, looking for a takedown. Tomimatsu pries her off and stands the fight back up. Oya chases Tomimatsu down with punches and kicks until they crash into a clinch. Oya pulls guard and works her legs into a high guard. Tomimatsu passes and again reasserts herself in mount. Oya futilely bucks as Tomimatsu aims for an armbar, but nothing comes of it before the bell. Tomimatsu drives forward for a single-leg, backing Oya into a corner. Oya manages to fend off the takedown attempt, but again gives her back up in the waist-lock. Oya breaks free and lands two hard kicks and a right hand before tripping to her back. Tomimatsu advances to side control. “Amiba” turns onto her knees and drives forward for the legs, but Tomimatsu maintains her balance and eventually slides her way into the mount again. Tomimatsu drops punches to Oya’s body as “Amiba” tries to shove her off. Referee Matsumiya calls for a break as Oya’s head goes beneath a turnbuckle. It doesn’t stay up long, as Tomimatsu gets a single-leg back into Oya’s half-guard. Tomimatsu passes to side control again. In the final minute, Tomimatsu again takes mount to drop punches to the body while Oya bucks wildly. She manages to free herself and gets to her feet in the clinch right as the bell sounds. Judges Ryogaku Wada, Kenichi Serizawa and Akira Yamazaki all see the fight for Tomimatsu, who takes the clear-cut decision. Winner: Emi Tomimatsu by Unanimous Decision after two rounds. She improves to 5-4-0. Referee for this bout is Kenichi Serizawa. Haga circles out and lobs low kicks while Miura adopts a piston-punch approach. Haga wisely clinches up and captures Miura’s back in the waist-lock. Referee Serizawa breaks them up and Haga returns to low kicking at range. Miura throws a few leg kicks of her own, mixing them in with her jabs. Haga lands a hard left and “Iris” dives for a takedown. Haga pancakes and transitions to Miura’s back, where she slaps on a rear-naked choke. Miura defends and tries to pry off and then tie up Haga’s hands. Haga heel kicks Miura’s thigh and drops punches to her flank while waiting for a choke opening. Haga slips the arm in during the last ten seconds and gets the catch. However, Miura lasts until the bell. A very, very strong round for the Team Hellboy product, Haga. Haga stays on her bicycle and backs away, throwing leg kicks and counterpunches as Miura gives chase. She lands several stinging punches as Miura closes into range. Haga is timing Miura’s punches now and she’s landing some really good, solid shots to the face; so much so that she’s now the one giving chase. Miura is still able to land the occasional counter, but Haga is apparently setting the pace here. That is, of course, until Miura goes for a takedown and pulls Haga into the judo press. From on top, “Iris” locks up a keylock and gets the tap at the 2:12 mark. A devastated Haga pounds the mat in frustration. Winner: Ayame Miura by Submission (Keylock) at 2:12 of round two. She improves to 5-0-0. Both women neutralise each other standing for the better part of two minutes until Kusaka hits a harai-goshi into the judo press. Kurobe soon reverses the position to take Kusaka’s back. Kusaka then powers her way into a reversal of her own, taking top position in half-guard, where she fights to pass until the bell. It’s a repeat of the first half of round one in the second stanza, but Kusaka manages to pass to side control instead of giving up position. She scissors Kurobe’s head while working for a Kimura. Kurobe locks up her arms to defend and Kusaka resets, this time going just for the leg scissors. She manages to place it just right, forcing the tap at 3:17. Winner: Miyoko Kusaka by Submission (Leg Scissors Choke) at 3:17 of round two. Referee for this bout is Akira Yamazaki. After both women throw furious punches at one another, Takano hits Irie with a harai-goshi takedown and almost transitions right into an armbar. Irie survives and escapes, but she’s not out of shark-infested waters just yet. Takano switches to a guillotine choke instead. Irie looks caught, and to drive the point home, Takano falls back to the canvas to force the tap soon after at 1:05. Winner: Satomi Takano by Submission (Guillotine Choke) at 1:05 of round one. The much taller Sato spends the round chasing her shorter opponent around the ring, putting her longer punches and low kicks on Matsuda. Matsuda isn’t defenceless, however, and she counters with leg kicks of her own and the occasional upward right straight, like Little Mac in Nintendo’s Punch Out. Matsuda stays on her bicycle and, despite eating a few punches and kicks, still manages to time Sato’s strikes in order to deliver her punishing counterpunches. They snap Sato’s head back and embolden Matsuda to continue hunting for big openings. This arguably earns her the fight as she gets a clean sweep on the scorecards. Winner: Reina Matsuda by Unanimous Decision (20-18, 20-18, 20-19) after two rounds. It’s a whirlwind of punches and kicks in round one, and not exactly in a great way as both women are throwing and connecting but not exactly defending. Someya piles up the body kicks while Miki pushes forward to put punches in her opponent’s face. A largely even round as a result. Someya manages to land some hard punches directly to Miki’s face and Miki wilts. Someya closes in and lays the punches on thick, prompting referee Ryogaku Wada to give her a standing eight count. Someya finishes strong with more punches and body kicks for a unanimous decision victory. Winner: Akiko Someya by Unanimous Decision (20-17, 20-18, 20-18) after two rounds. Celine Haga needs a new career.